HST knows HSD Spindle Repair and Rebuild. CNC router spindle spindle repair to original factory performance with a full warranty. 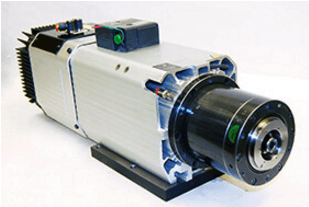 Call 1-603-483-0333.
Who should you trust to repair your HSD spindle? Before you choose an independent repair facility get the answers to these important questions. Below are some examples of our OEM quality repairs on HSD spindles. HSD SpA Mechatronics located in Pesaro Italy, manufactures a broad line of high quality spindles. HST located in Candia, New Hampshire repairs all HSD spindles back to OEM like new condition and we offer a full OEM equivalent warranty. If your HSD routing spindle has increased vibration or is making louder than normal noise it may be bad bearings and it may be near a complete failure. Bad part finish such as “chatter marks” are other indications that a spindle needs repair and rebuilding. If possible it is always best to repair or rebuild your spindle before a catastrophic failure where additional damage may occur. At HST we replace all bearings with top name brand ABEC 7 super precision spindle bearings. 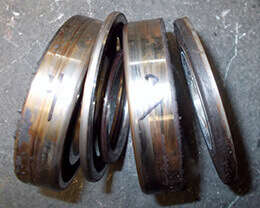 Our spindle repairs include replacing or restoring all worn springs, seals and critical surfaces. To eliminate vibration, extend life and improve part quality, all HSD spindles are high speed balanced. We guarantee that after our repair, your spindle will perform like new. If you are experiencing bad finish and “chatter marks” our repairs will eliminate them. For over 30 years HST has provided the CNC machining community with a high quality alternative to high price OEM spindle repairs. Spindle repair is what we do so we have to be good. HSD spindles are commonly used in routing operations on wood, plastic and aluminum extrusions. Over the years HSD has expanded their spindle line to handle stone cutting and heavier metal working. On the left is a HSD 919 routing spindle typically used for wood working and aluminum extrusions. On the right is a much more robust HSD ES791 spindle. See below for the repair stories. Expert HSD Spindle Repair 1-603-483-0333 Full Warranty, Fastest Turn Around. OEM Trained technicians. Repairing Spindles since 1986. When we received this stout HSD ES791 spindle for repair the shaft was seized. The motor windings and electrical components checked out good. As we took the spindle apart all of the bearings appeared to be in good condition. The lubrication still looked clean. As we dug deeper we found that the actuator flange was friction welded to drawbar. This is an indication that a tool change attempt was made while the spindle was rotating. We have seen this type of failure more than once with HSD spindles. We don’t think this is a spindle fault. Rather we suspect a machine programming deficiency. In any event, our customers are always informed as to the cause of failure. All of the galling due to friction welding was machined clean and the spindle was completely rebuilt with all new top name brand ABEC 7 super precision spindle bearings. So how did it run after the spindle rebuild? As good as new! Runout at 300 mm on our test bar was only 2µm. Maybe better than new. Vibration was 0.03120 in/sec. We received this spindle for rebuild because it was not releasing the tool. Besides that there was the small problem of a seized shaft. There was clear evidence that this stone cutting spindle lived a tough life. Critical mounting surfaces were damaged in several areas. We repaired these to ensure proper mounting to the machine. The taper was also dinged up and we gave it a kiss-grind to guarantee low run-out. Left, HSD ES721 spindle as received. Stone cutting spindles lead a hard life. Right damaged mounting surfaces need to be repaired for proper seating. The more we dug into this spindle the worse it looked. Badly contaminated bearings and damaged encoder. But even in this condition HST can rebuild HSD spindles to like new condition. The drawbar assembly was completely rebuilt and functioned perfectly. When we were finished we had 1µm run-out on the taper and vibration readings of 0.02740 in/sec. ; big improvement. Left HSD spindle rebuild complete and ready to ship. Right HST tech checking sensor outputs. When we received this HSD ES919 spindle for repair there were no external indications of the problem. But when we go to the bearings we found the source of the vibration and noise. They we nearly dry. The customer made the right choice taking the spindle out of service when they did. When bearings fail catastrophically, that is when the cage fails, all of the rolling elements can clump together. This can cause a sudden seizure of the shaft. Stopping a shaft rotating in excess of 12,000 RPM in a small fraction of a second can result in additional costly damage. For some tips about keeping your spindle healthy visit our blog. 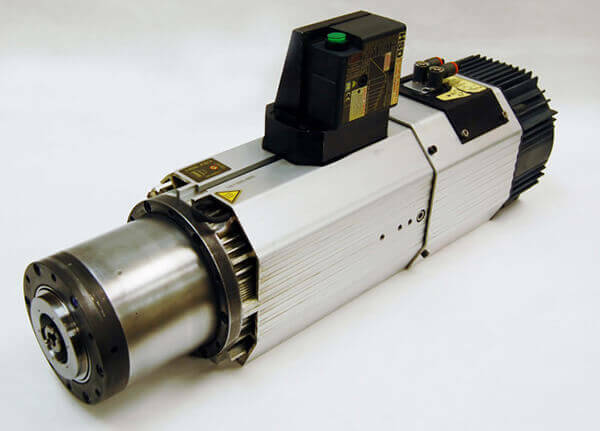 The HSD ES919 routing spindle is air cooled with automatic tool changer. It is an excellent routing spindle that is often used on CNC routing tables for wood, aluminum, plastic and other non-steel materials. This HSD spindle was completely repaired with all new top name brand bearings. When we were done the performance was excellent: 4µm on test bar and the vibration measurement at the front was 0.035470 in/sec. Good as new. The customer reported that this HSD ES988 spindle would get a signal saying the tool was not clamped. We tested the sensor and it functioned properly. Although this problem manifested itself with the clamp sensor the problem was actually excessive bearing play or looseness. These spindles use small diameter proximity sensors to detect when the drawbar is fully clamped with a tool in place. To function properly the target (the place where the sensor detects) must be in a very precise spot. We found that the rear bearings were very worn. The allowed the target to move away from the sensor and appear to fail. HSD ES988 spindles have proximity sensors in the back of the spindle that can detect the position of the tool clamp mechanism. It can tell if it has a tool or not (5 sensors shown). 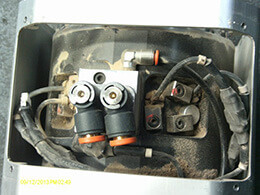 These sensor provide an important interface with the machines controller. The bearings were not only worn but also displayed fretting corrosion which is an indication of a loose fit. Our GPG process can correct this issue. When the rebuild was completed we measured 8µm at the end of our test bar and front vibrations readings were 0.038570 in/sec. Well within passing. When we received this HSD ES791 stone cutting spindle we noticed a “rub” when we turned the shaft by hand. The run-out on the taper was a tremendous 86 microns. All indications were that the spindle was crashed. The customer provided the bearings for the repair. While we will accommodate and use customer provided components, we will not provide warranty on those parts and this can be a problem. One of the problems with purchasing your own bearings is the proliferation of counterfeits. Another issue is handling. Supper precision spindle bearings are extremely sensitive to mishandling. They are easily damaged and the damage is very hard to detect until after the rebuild is complete and we do vibration analysis. And finally it is not likely to save money. We purchase over $250,000 of super precision bearings a year and we buy at good discount. So why muddy the warranty waters. When we provide the bearings there is no question as to what we will warranty. When we received this spindle the run-out on the taper was 86 µm. After our GPG process the taper run-out was only 1 µm.